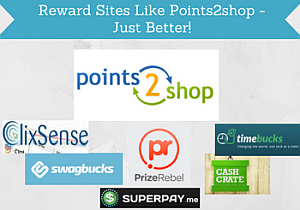 6 Reward Sites Like Points2shop – Just Better! Points2shop is a pretty popular paid survey site, as it according to the company itself has over 10 million users. If you do not know what the site is about, you can check out my full Points2shop article to get all the details. If you have read that article, you will know that it is not a site that I am too crazy about. It does however have some good potentials and I like many of the ways of earning the site offers. Because I like the concept and the earning methods, I have made a list below of 6 reward sites like Points2shop, that are similar in the way you can make money. In my opinion, the sites on the list below are however better than Points2shop, and below I will expand more on why. Why consider other reward sites than Points2shop? Points2shop has some great opportunities to earn as you can do paid surveys, take online offers, refer people, participate in contests and play games. There are however reasons that it can be worth considering joining other sites instead or as well. There are quite a few sites that offer similar ways of earning, but that has some advantages that Points2shop does not have. Points2shop is one of the least user-friendly sites I have used, and it is unnecessarily complicated. Also, the payout system does not provide good options for all. Many of the points you earn can only be used to buy products on Amazon.com. This can be a great reward, but you can only have the products shipped, if you live in the US, UK or Canada. So overall, I think the site is way too complicated and confusing to use, and at the same time, the payout system is not as great as on many other online reward portals. 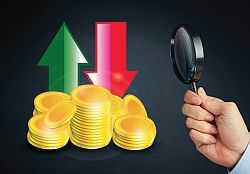 There are several sites that have similar options, but are a lot easier to use, offer more and better opportunities, and at the same time offer great payout methods, where you can choose how to get your money and are not forced to use a part of it on products. If you are already a member of Points2shop and like to use it, it is great, and great to continue doing this. But whether you are already a member or not, it can be good knowing that there are some great alternatives that can worth considering joining as well or instead. How much can you earn by joining other sites? Let us first get it clear that being a member of online reward portals and doing paid surveys is not something that will make you rich no matter which and how many sites you join. It can however give some great extra money on the side. By only being a member of one site, it will give limited opportunities. Sometimes some sites have the same surveys or offers, and you can only get paid to do them at one portal of course. But very often the different sites also have different surveys and different opportunities. That is why it is great to join several sites. I personally think Points2shop is too confusing and takes too much time to use and figure out, because it is made in a complicated way. Therefore, there are better earning opportunities by joining other sites. And if you are already a Points2shop member, you can add a lot to your earnings by joining more sites. If you can join 3-5 sites for a start, it will give you great opportunities, if you join the right sites. You will also this way get to test which options and sites fits you the best. Once you have found out, you can then expand to other sites as well, if you feel like it. But if you join for example 15 sites at once, you might be overwhelmed and not take the time to really get to know and benefit fully from the sites. If you like the options Points2shop offers, the sites on the list are a great place to start. There are many online reward portals and paid survey sites. The below is not a complete list of all the sites that are worth joining. It is a list of the 6 sites that I have tested that are the most similar to Points2shop in what they offer. So all the sites on the list below have a lot of earning opportunities. Many of them similar to Points2shop, and some of them also have slightly different options. PrizeRebel is one of my overall favorite online reward portals. It is similar to Poinst2shop in the many ways of earnings. It also has paid surveys, and an offer wall with online offers, it has some great free contests, and you can get paid to play online games. In addition, PrizeRebel has some extra great opportunities as there is a daily challenge, where you can earn a little bonus by having a certain activity in a day, you can earn by doing online tasks through CrowdFlower, and it regularly has promo codes, where you can get free points. In my opinion, PrizeRebel does not only offer more and better opportunities than Points2shop, it is also super easy to use, and you can choose to get paid through PayPal or choose between many gift cards. You can join no matter where you live, but there will be most opportunities for English-speaking countries, but there can still be great opportunities for other countries. If you like doing paid surveys and being a member of online reward portals, PrizeRebel is a must. SwagBucks is another must, if you would like to make some extra money on online reward portals. It is one of the most popular sites in the world and has more than 20 million users. As Points2shop, SwagBucks offers you to earn by doing surveys, taking online offers and by playing games. And then it has some other great opportunities as well. SwagBucks has a great cashback program for online shopping on a big number of online shops, where you can get great discounts by shopping through SwagBucks. So if you like to shop online, being a member of SwagBucks can save you a lot of money. Furthermore, you can earn by watching videos, bu surfing the internet, and it gives you free money on your birthday. You can get paid through PayPal or through gift cards. It is only available in the US, UK, Canada, Australia, Ireland, Germany and France. If you live in one of these countries, SwagBucks is one of the best sites to join, and you will even get $5 joining bonus. ClixSense does not have quite as many ways of earning as Points2shop and the other sites on this list. The ways of earning that it has in common with Points2shop are paid surveys, it has a great amount of online offers through its offer wall, and you can earn be inviting friends to join. Furthermore, it has a great daily activity bonus, and you can earn by doing CrowdFlower tasks, and it has some great bonuses for people that are doing regular CrowdFlower tasks. So even though ClixSense does not have quite as many ways of earning, I think it belongs on this list, as it has great opportunities, and you can make good extra money on it. One of the great things is also that you can join no matter where you live. You can get paid through Payoneer, Skrill, Payza, Tango Card and check. CashCrate has many ways of earning and most of them are similar to the earning methods on Points2shop. You can earn by doing paid surveys, take one of the many online offers, play games, participate in contests and earn by inviting friends to join. Another way where it is a bit similar to Points2shop is that it can be a bit confusing to use at first, and it can take a bit of patience. It is however fairly quickly to figure out how to use al the options, but you still at times have to be a bit patient to find the surveys and offers your qualify for. But if you are a bit patient, it has good potentials. You can join no matter where in the world you live, but there are by far the most opportunities for people living in the US. There are also good opportunities for people living in Canada, the UK, Australia, Germany and France, but other countries will also have opportunities. You can get paid by check or PayPal. The first time you get paid, it does however have to by via check. TimeBucks has a lot of different ways to earn. Like Points2shop, you can do paid surveys, take offers, and invite friends. Furthermore, it has a lot of other opportunities, and some of them are quite unique. You can get paid to watch videos, to watch content on websites, to read emails, to grow a beard and to take selfies. Some of the options do not have the highest rewards, but there is for sure opportunities for all, and you can therefore join and have pretty good opportunities no matter where in the world you live. It is a fun site as some of the options are very unique for an online reward portal, and you can get paid through PayPal or Payza, which are both good ways to get paid. Superpay.me has a lot of earning opportunities. It is similar to Points2shop in the way that I am not really a big fan of the site, as it is quite confusing to use. It does however have some great sides, and many earning opportunities, and that is why it is on this list. There is a good amount of paid surveys, you can get paid to refer friends, it has many online offers you can get paid to take, and it has a quarterly contest where the people that do the most surveys will get some big cash prizes. The above list is my suggestion when it comes to sites that are the best to join, if you are looking for sites similar to Points2shop, or even looking for better sites. This is based on my own personal experience, and I have tested all the sites thoroughly. If you have any questions, any comments, or if you have any experiences with Points2shop or any of the other sites you want to share, I would love to hear from you in a comment below.